Sealing air leaks and adding insulation to the basement or crawlspace can yield substantial benefits if done correctly. While these improvements are generally considered moderate to difficult do-it-yourself (DIY) projects, whether you are a homeowner, or a qualified home performance contractor, there is a wealth of available information outlining best practices and project guidance. Note: When planning any home improvement, it is important to consider your area's specific climate and weather conditions. Some of the below resources reference the IECC Climate Zones when providing climate-specific guidance. 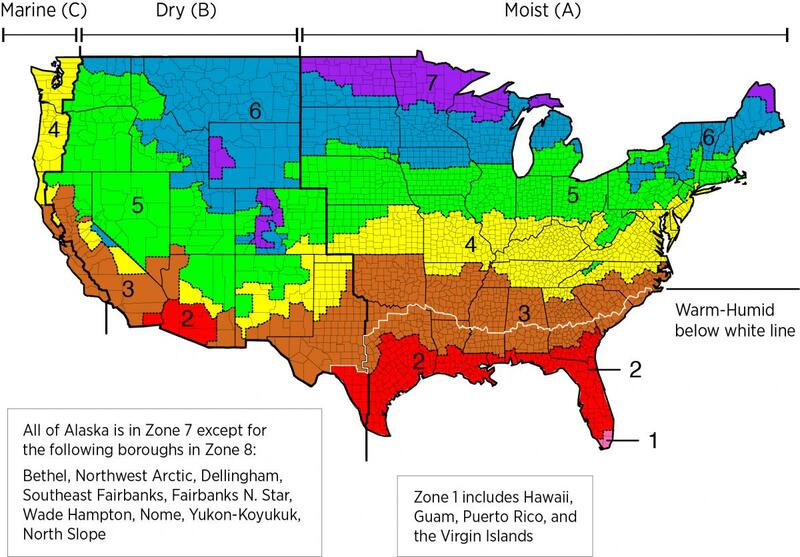 Learn which Climate Zone you are in, and view a larger map at https://basc.pnnl.gov/images/iecc-climate-zone-map. Air Sealed, Insulated Basements (PDF, 781 KB). U.S. Department of Energy's Building America Program, with content prepared by Steven Winter Associates, Inc., updated November 2017. 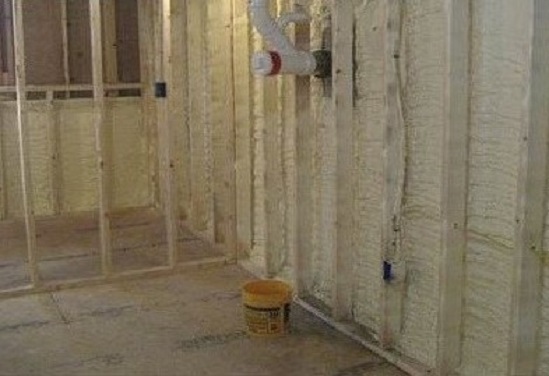 This guide describes how to insulate a basement to improve the overall thermal performance of the building and provide drier, usable conditioned space for home occupants and for HVAC equipment. BSC Information Sheet 408: Critical Seal (Spray Foam at Rim Joist) (PDF, 256 KB). Prepared by Building Science Corporation for the Department of Energy's Building America Program. This Information Sheet describes common problems air leakage at the rim and band joist, and guidance on application spray foam for remediation, factoring in condensation control, code acceptance, and more. BSC Information Sheet 511: Basement Insulation for all Climates (PDF, 309 KB). Prepared by Building Science Corporation for the Department of Energy's Building America Program. This Information Sheet describes how basements should be designed and constructed to be dry and conditioned. Includes installation guidance and diagrams. Renovating Your Basement for Moisture Control and to Improve Energy Efficiency (PDF, 384 KB). Prepared by Building Science Corporation for the US Department of Energy's Building America Program, 2003; revised 2007. This report explains how heat loss through uninsulated basement walls can account for up to one-third of the heat loss from an average home, and how to properly install insulation on basement walls, especially when combining the project with "finishing the basement." Air Sealed, Insulated Basements (PDF, 781 KB). U.S. Department of Energy’s Building America Program, with content from Steven Winter Associates, Inc., updated November 2017. Measure Guideline: Wall Air Sealing and Insulation Methods in Existing Homes – An Overview of Opportunity & Process (PDF, 1.4 MB). S. Roberts and R. Stephenson. Prepared by the NAHB Research Center Industry Partnership for the U.S. Department of Energy’s Building America Program, September 2012. This measure guideline can be shared with homeowners to help them understand the retrofit methods that can be employed in their home and the benefits of wall air sealing and insulation, including lower energy bills, enhanced durability, and increased comfort. ​Water Management of Existing Basement Floor (PDF, 67 KB). Prepared by Building Science Corporation, lead for the Building Science Consortium (BSC), a DOE Building America Research Team, updated December 2017. This guide describes how to retrofit a basement floor or slab to reduce moisture issues. BSC Information Sheet 512: Crawlspace Insulation for all Climates (PDF, 354 KB). Prepared by Building Science Corporation for the Department of Energy's Building America Program. This Information Sheet describes how crawlspaces should be insulated and have a continuous sealed groundcover of vapor diffusion resistant materials. Includes installation guidance and diagrams. Designing Closed Crawlspaces (PDF, 618 KB). Dastur, Davis, Warren. Advanced Energy, February 2012. This quick reference guide summarizes of design implications and recommendations for builders, code officials and consumers who are considering designing or installing a closed crawl space. Includes two sample designs. Guide to Closing and Conditioning Ventilated Crawlspaces (PDF, 1.2 MB). Bruce Dickson, IBACOS, Inc. Prepared for the National Renewable Energy Laboratory (NREL) on behalf of the U.S. Department of Energy's Building America Program, January 2013. This how-to guide explains the issues and concerns with conventional ventilated crawlspaces and provides prescriptive measures for improvements that will create healthier and more durable spaces. Technology Fact Sheet: Crawlspace Insulation (PDF, 215 KB). Written and prepared for the U.S. Department of Energy by Southface Energy Institute and U.S. Department of Energy's Oak Ridge National Laboratory (NREL), December 2000. Building science and how-to technical guide for sealing, moisture-protecting, and insulating crawlspaces to increase comfort and durability of a home. Vapor retarder applied to floor or crawlspace. Source: Guide to Closing and Conditioning Ventilated Crawlspaces. Bruce Dickson, IBACOS, Inc. Prepared for The National Renewable Energy Laboratory on behalf of the U.S. Department of Energy's Building America Program, January 2013. Floor Above Unconditioned Basement or Vented Crawlspace (PDF, 535 KB). U.S. Department of Energy's Building America Program, with content from the Pacific Northwest National Laboratory (PNNL). Last updated March 14, 2016. Guide describing how to air seal the floor above an unconditioned basement or vented crawlspace. Video tutorial, content courtesy of New York State Energy Research and Development Authority (NYSERDA), July 2015: https://www.youtube.com/watch?v=BqB82aVdTFM&feature=youtu.be. Insulation Fact Sheet (PDF, 1.1 MB). Prepared by Oak Ridge National Laboratory for the U.S. Department of Energy's Building Technology Program, 2008. This fact sheet will help homeowners understand how insulation works, what different types of insulation are available, and how much insulation makes sense for in a specific climate. Webpage with written recommendations for homes in the southeastern U.S., and links to articles, products and suppliers, videos, technical reports, and a research report. Considering a sealing and insulating project for your basement or crawlspace? Sealing air leaks and adding insulation in the basement are generally considered moderate to difficult do-it-yourself (DIY) projects, but the benefits can be substantial. If you are doing a major home renovation project, now may be a great time to tackle this project too. The good news is that even if you're not comfortable taking on this project yourself, there are many qualified contractors who can help you get the work done. Gather all your tools and supplies before you begin to minimize trips into and out of your basement or crawlspace. Be sure that the work area is well lit. Use a drop light for most of the space if necessary and keep a flashlight or headlight handy. During cold weather, try to pick a temperate day and wear warm clothes. If you have an appliance that uses oil or gas, consider hiring a Home Performance Contractor to test those appliances to ensure they are properly drafting combustion gasses before and after sealing your home. Sealing in some cases can cause naturally venting combustion appliances to backdraft gases back into your home, creating unsafe conditions. Sealing your home can trap indoor air pollutants. To properly address this may require additional mechanical ventilation to maintain safe air quality in your home. For more information on safe ventilation methods, visit EPA's Indoor Air Quality for Homes Page. Step 1. Seal any gaps or cracks in basement wall, ceiling or floor. It is best to seal up the top and bottom of the inside of the rim joist cavity. This is especially important at areas such as bay windows that hang off the foundation. Use caulk for any gaps or cracks ¼ inch or less and spray foam for anything larger. It is also very important to seal any holes for wires, pipes or other service areas that may lead to other floors of your home. Step 2. Cut insulation and insert accordingly. 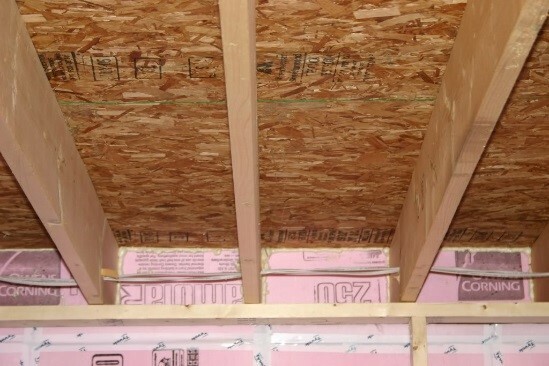 Insert and secure all insulation between holes in rim joists. If using batts, cut the insulation to fit and place against the rim joist. 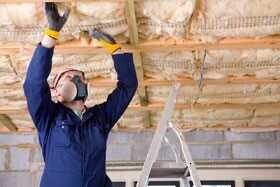 If using rigid foam insulation, foam around the edges to hold the insulation in place. After installing the rigid foam insulation or fitting batts into rim joists, seal any remaining holes and cracks to make your basement airtight.